Gumbo is certainly a hodge-podge of cultures, made up of the culinary pickings from across the globe. “Gumbo” comes from the African Bantu word for okra, “nkombo.” Gumbo is typically thickened with either okra or filé. Never heard of filé? It’s a Native American cooking powder, made up of dried and ground sassafras leaves. Then there’s the roux, which comes from France and other places in Central Europe. Best of all, there’s no “right way” to make gumbo. Gumbo’s just about as ambiguous as food comes. You can make it with sausage and chicken, duck, squirrel, or rabbit. Or, make it a seafood gumbo, with shrimp, crawfish, crab meat, and fish. You can toss in andouille sausage. Make a vegetarian gumbo, or a vegan gumbo if you feel compelled. It can be thick or thin. It’s versatile for any palette and best served with rice. Gumbo is celebrated every year in the French Quarter during the Tremé Creole Gumbo Festival, where they mix a brass band showcase with Louisiana’s favorite stew. Presented by the New Orleans Jazz & Heritage Foundation, the annual fest features the best brass jazz bands around, with Grammy-winning Rebirth Brass Band, Hot 8, and those from Tremé and the Free Agents. Best of all, it’s free! The dish is presented at the fest every year in a variety of styles and for a variety of diet restrictions, from vegan to gluten-free. 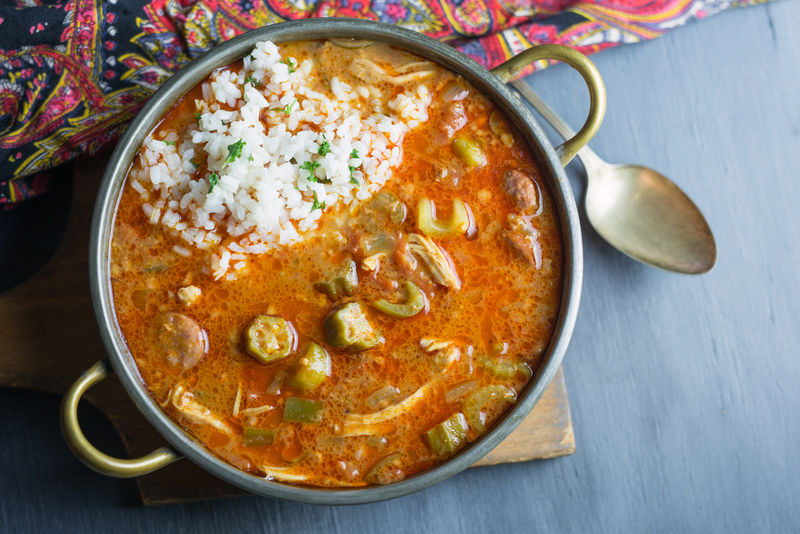 This is a great opportunity to try different takes on gumbo. There will also be daily gumbo cooking demonstrations by New Orleans’ favorite chefs. Make sure you’re in town for this year’s fest, held Nov. 17-18 at the Armstrong Park in the French Quarter. Book your stay with us at Hotel St. Pierre, just blocks away from the venue. Although our hotel is located right near all the action of Bourbon Street, it’s tucked away and provides the privacy and peace you need during your stay in the Big Easy. Check out our best rates. Want to eat like a local? Read our local food guide for the best New Orleans eats.